‘First Steps into Learning and Teaching in Higher Education’ is a free online course, which will run from 21 May to 22 June 2012, and will introduce new and aspiring lecturers to teaching and professional development in higher education. We also welcome experienced lecturers who wish to update and share their knowledge and expertise. We will know you are interested and have your email address, should we need to contact you or you us. You will be able to tell us whether you are interested in being assessed. We only have 25 assessment places, so do register early if you are interested. The three activities we have designed, which you can find details of on the Moodle site, are for everyone – not only those who choose to be assessed. We hope that many participants will complete these activities, openly share them and that there will be lots of peer assessment. 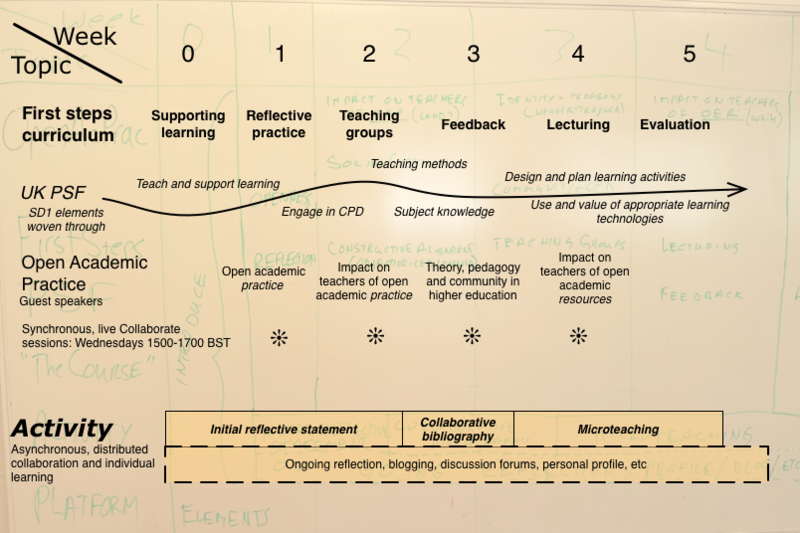 For us, this would exemplify open academic practice and also engagement with some of the principles of learning and teaching in HE. By registering and opting for assessment, you will be agreeing to complete the 3 activities and will receive feedback on these activities from George, Marion or me. At the end of the course you will receive an Oxford Centre for Staff and Learning Development (OCSLD) Certificate. Details of the activities can be found on the Moodle site. Once you have registered, click on each of the tabs for each week to access these, but please remember that the site is still being developed so there could be changes to the content before the course opens on May 21st. This is a ‘massive open online course’ (MOOC), and offers you the freedom to decide whether you wish to be assessed (and receive a completion certificate), how you want to engage with the course and how much you want to interact with the content and other participants. This is an exciting but rather daunting process. We have had lots of interest, with people from all over the world expressing interest in different aspects of learning and teaching in Higher Education. We have deliberately chosen to distribute the course across different platforms – WordPress (for the Home site), Moodle (for the course), Blackboard Collaborate (for the live synchronous sessions) and we are still discussing whether or not to have a separate wiki site, or to go with the wiki in Moodle. The reason for this decision (i.e. the different platforms) is that we hope to introduce participants new to teaching in HE to the idea that learning can take place in a variety of online spaces. Access to our WordPress site has been open pretty much from the word go, and now access to the Moodle site has been opened, despite the fact that neither of these is yet ready. For me, this is a new way of working and takes a bit of getting used to (heart in your mouth stuff!). Finally, we are conscious that the course has been designed to attract people for whom this way of working and the technology involved might be completely new –so we have to achieve the right balance between providing enough structure and support and encouraging open academic practice and independent learning – one of the many tensions involved in designing a MOOC. We hope lots of people will register and find the course useful, and that you won’t hesitate to comment or ask questions as we continue to get ready for this MOOC.